Nigel Gamble is a man with everything – including a dark past. He took his name from his early business successes, but in reality, none of it was based on risk – only certain success. Every decision Nigel has ever made in business, people, sport or life had been based on some prior knowledge. When a stranger appears it shakes his rich world to the core. But Nigel has been waiting for him – and preparing. Now it's a fight to the death – there can be only one winner. ★★★★★ Brilliant read, could not put it down! Enthralling from the start, not sure what was gonna unfold, did not disappoint. Great subject with realistic storyline that made you think that it could just be possible. Didn't wanna put it down and when i did was constantly thinking what was gonna happen next and when could i read some more. Am following this author forever, write some more! Inspired me to write my own! I don't read much fiction but gave this book a go as it was recommended to me. The book is an easy read and a very nice debut. The story takes a bit of time to develop from the different bits and pieces that are offered in the initial pages, but it remains captivating long after the plot has been revealed (or guessed, depending on the reader). Doesn't bore and doesn't get repetitive. The descriptions are detailed enough to allow readers to form a picture in their mind without being stringent, which I imagine is a difficult thing to achieve as a writer. In my opinion, the book would benefit from a bit more variety in writing style – but as this is the author's debut, I look forward to see that develop in his following books. That said, the story is solid, and the style fits the plot. If you are interested in fiction and are looking for a good entertaining story by a new author, this is definitely a good choice! Intriguing story, needs concentration at first to get to know characters then as the tale unfolds it's a non stop read leaving a desire to know more at the conclusion. Loved it! Took a little while to settle into, but interesting along the way. Once the direction is revealed and the intrigue begins to build you’re hooked! Forget putting this book down! With a hero I’d love to meet, a bad guy worthy of a Bond villain and a great supporting cast, you are drawn into a world of possibilities. As the tension builds, the stakes are raised and the plot winds its way through a complex series of events, the reader is challenged to keep up. But is this really the end? Where is the end and where is the beginning? More please Tim! As soon as I read the overview on the back of the book I was completely intrigued, and as I started to read the book I became even more engrossed by the story. I loved the way the stories and characters intertwined, and it kept me guessing to the end! It was just the kind of thriller that I love, with lots of unexpected turns. A third of the way through the story goes into a completely different level that I wasn't expecting, and I was fascinated by the whole concept. It's the kind of story that you just can't imagine how it's all going to end. A really brilliant novel that keeps you guessing to the end and I loved reading it this summer and was sad to come to the end of it. I can really imagine it as a blockbuster film and it would be the sort of film that when I saw the preview..I would have to go and see! I can't wait to read the next Tim Heath novel! Absolutely brilliant. 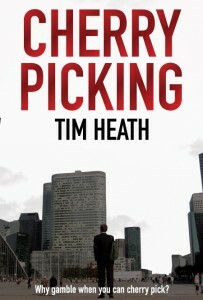 Cherry Picking was a delightful read, quick and highly entertaining. Lots of interesting twists and creative concepts. Well worth reading. A memorable story with a great conclusion. I could definitely see this book end up as a movie. Highly recommended! A story with depth. I found myself wondering on many parts ‘how is it possible' then the book reveals more over the pages then you get plenty of ‘wow that's what it is' moment. I ended up purchasing another to be sent as a gift. Truly Hollywood material. Looking forward to the author's coming publications. Great book – gripping read!! Cherry picking is a real page turner! Great characters, suspense and plot twists all the way through. It started like a Tom Harris/Michael Dobbs political thriller, with a huge twist of sci-fi that took it to the next level.Looking forward to the next one! Bought this book a few days ago and have been reading non-stop. This is a really good story with an author behind the book with a tale nearly as exciting! Buy this book and have a read with a story that's as good as ever I've read. I only get to read last thing at night but still finished it in less than a week! (I did find myself picking it up at other random times of the day though!) The destinies of the various characters are interwoven very cleverly as the story develops. Plenty of twists and turns to keep you guessing. Looking forward to this author's next offering. ★★★★★ Dying to know how it ended..but didn't want it to end! I was given this book as a gift and had no idea what to expect. But after the 1st few pages I was absolutely hooked! Full of intrigue and a fascinating story line, it had me gripped from the start. I was often referring back to earlier parts of the book to remind myself about a particular detail or person as the character's lives become so intertwined and complex. It was a real challenge to try and work out what was going on-and why-and when!! I love the way the characters and story-line are presented in small chunks to begin with, then everything starts to merge and become more and more involved and you realise there is a whole other depth to the plot and the story seems to hit another level! It would make a brilliant film. The thought of the story becoming reality is a frightening concept but the theme of good versus evil gives reassurance and faith in humanity! The story-line crescendos and ended just a little too suddenly for me, but I would most definitely read another of Tim's books and am excited to see another is on the way- very soon please! Really enjoyed this fast-paced novel. Sometimes it's best if you don't know too much about a story before reading it, so I won't give away any of the plot. Once you've read the first five chapters, you'll find yourself curiously hooked. This novel is clearly in the can't-put-it-down category: faced-paced from beginning to end. I felt continually compelled to read on and to find out the next stage in the development. I enjoyed the challenge of putting together lots of pieces in a jigsaw puzzle as the different strands gradually came together. By the time I was a third way through the novel, it began make to sense, certain things began to dawn on me – although I also needed to refer back from time to time to remind myself who a particular character was. But this was part of the enjoyment. As I read on, it gradually became clear how this Nigel Gamble obtained his ability to predict the future. Nothing spooky or supernatural at all! (But I don't want to spoil it for you).I also began to ask myself a few interesting philosophical questions: What would have happened if someone had interfered in a certain way in my own life at such-and-such a stage? Where would I be now? Would I be the same person? Is there such a thing as predestination? What if there is? What if there isn't? How open is the future? To what extent is my life determined by my own character? By circumstances? By coincidence? By other forces? And what about history itself? Although the novel itself contains no religious elements whatsoever, this novel may even serve as a good starting point for a discussion between believers and non-believers in God. In fact, the big question that you are left with at the end is: What if? ★★★★★ Suspense packed novel that never slows down! Cherry Picking was my metro commute read this summer. Parts of the novel were so suspenseful that I actually missed my stop on the train and didn't even notice! I highly recommend this book to someone who enjoys mysteries and plays detective on their own to figure out the characters and plot. The book's structure is similar to the movie Crash where a lot of individual story-lines start to mingle and intertwine in really unique and creative ways. Even with these separate story-lines, the book never gets slow or dull and always kept my interest. The theme of good versus evil in the book really shows an interesting side to how far people are willing to go for self-preservation. I think the author did a great job of keeping the book tightly knit and not letting too many loose ends fly around. While the book doesn't set itself up for a sequel, I'd really like to see one come out of this. I think one of the author's main strengths is the descriptive quality within this book. He takes time to set the stage for the reader so this novel really reads like a mini-series and the flow of the novel makes it easy to picture. All in all a great book!